8:00 PM transfer to Hanoi station to take a night train to Lao Cai. Our guide pick up you at Lao Cai station. Drive to Sapa, have breakfast. Begin your Sapa holiday by visiting local market, where minority people come to sell or buy dailythings. 14:00 Continue your Sapa holiday by walking to Cat Cat village of Black H's Mong minority group. Visit their cottage to discover daily life. You can talk to them through your guide. Visit beautiful waterfall and valley with terrace rice fields. Back to your hotel. The first day of Sapa tours end. 9:30 Enjoy easy walk to Lao Chai village where The H's Mong people live. Then visit Ta Van village where the Dzay and red Dzao minority groups live in harmony together. The two villages are located in Muong Hoa valley with very large rice paddy terrace fields on the slopes of high mountains. The incredibly stunning scenery, the attraction of all Vietnam holidays, offers many amazing photoes. Mix yourself and the nature into a unique glass of cocktail. At other corner, see them enjoying great party after a long week working or some boys flirting girls. Coc Ly is not only a market for selling, buying local things but also a meeting area for young couples. After market, take a boat trip along Chay river, enjoy the beautiful scenery of both sides. 15:00 Drive back to Lao Cai station. Take overnight train back to Hanoi. 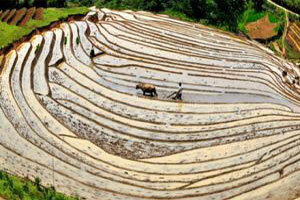 Amazing experience why Sapa holiday highlights all Vietnam holiday packages. Arrive in Hanoi at 5:00 AM. Car pick up and transfer to your hotel. Now, your Sapa holiday ends. Note: Departure on Wednesday for Can Cau market. Departure on Monday for Coc ly Market.